He posted some pictures of a one-off part he made in brass [qv] and CPF went nuts. Eventually he did a small run of these in Derlin (a nylon resin which turns very easily in a lathe) and I grabbed one. It’s a hell of a mod considering it only takes 30 seconds to install. When I finally break down and get the lathe, the first thing I’m going to do is turn a few of these in brass. This allows the user to see if the power is still on when the light is set head-down on a table, and also gives it a little more “bite” when used as an impact “tool” (though nothing like the TID or the Porcupine). 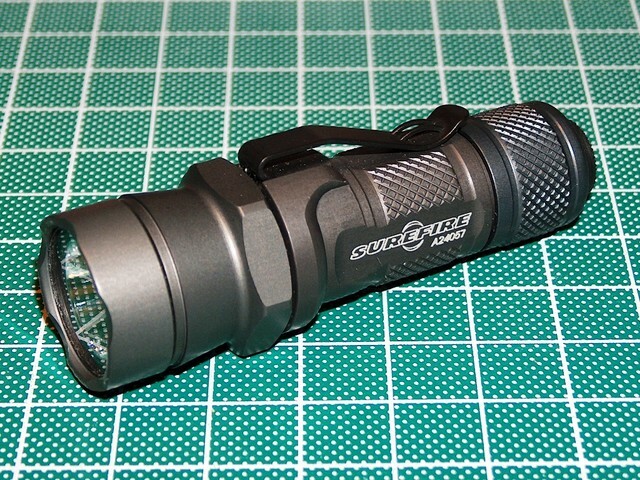 Don describes a modified “snake catcher” screwdriver in his light engine build notes [qv]. A small notch in the blade of the screwdriver allows one to wrange the wire into position, then hold it in place for soldering. 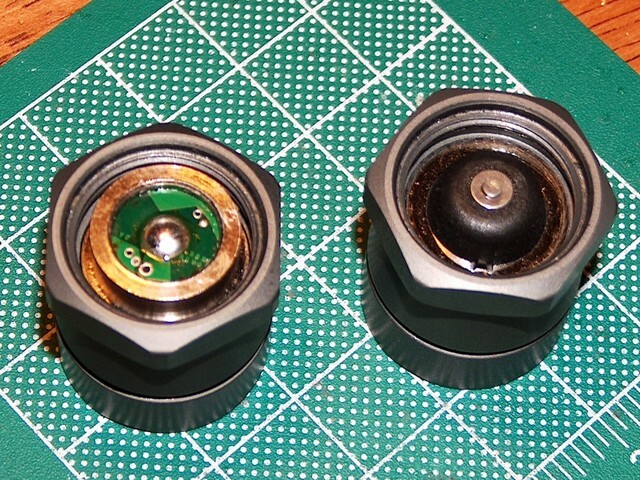 I took a standard (non-reinforced) Dremel cut-off wheel and sliced a notch in a cheapo flatblade precision screwdriver. However, the resulting notch was too wide and would not securely hold the lead wires. I figured a diamond wheel might work better, since they are considerably thinner than the standard cut-off wheels. However, a single genuine Dremel diamond wheel runs about $15. I found a five-pack of knock-off Chinese diamond wheels for $10 at Harbor Freight, and it even included a mandrel. The quality of these wheels is more than good enough for my purposes. The diamond wheel is about half the thickness of the standard cut-off wheel (o.5mm vs. 1.0mm), which was just about perfect. Today I received some samples of a new Chinese-made clone of the Lumileds Luxeon LED. The clones are easy to identify when they are mounted on the star heatsinks, as the solder pads are flatter, the heat sink itself is a much lighter metal, and there is no binning or model number marking on the back, but the emitters themselves are almost perfect copies. The only significant difference I could see was in lens clairity - and even then, I needed a 10x loupe to see the difference. I think the lens fogginess is caused by surface defects and could probably be polished away. The clone also seems to have more “fuzz” around the edge of the lens, and this could be related to the poor polish of the lens. Everything else seems to be indistinguishable, even the phosphor layer, which I expected would be the weak link in the clones. Initial informal testing was impressive. To my eye, color and brightness of the bare clone emitters are on a par with some TX0J Luxeon III emitters I have on my bench. I will have to conduct further tests with some optics and reflectors, which generally makes it easier to pick out differences in color. 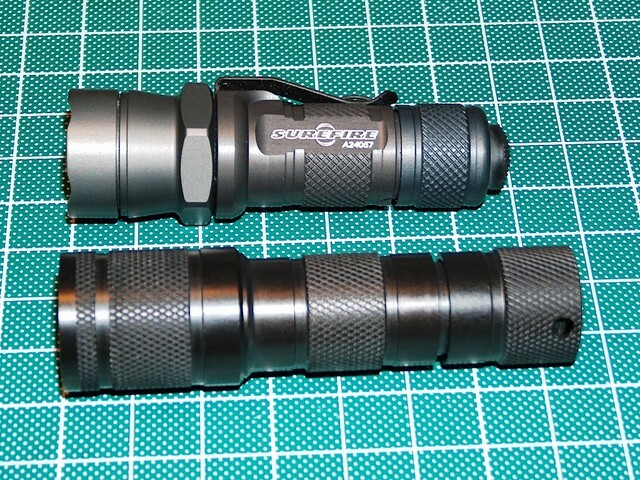 My initial feeling is that even if these do perform well, I will probably not use them in any flashlights, since the $9 savings ($7 for a clone vs $16 for a good-binned Luxeon III) isn’t a significant enough amount in a $200 flashlight to make up for the unknowns in binning and long-term reliability. For projects needing a large number of emitters, though, these might be more than acceptable. I just got some Aleph parts plated in nickel-chrome from KJ. The finish is perfect, and gives the pieces the cold feel of good tools. It’s very difficult to caputre the shininess in a photograph.